all stacked up - courtesy of a helper. 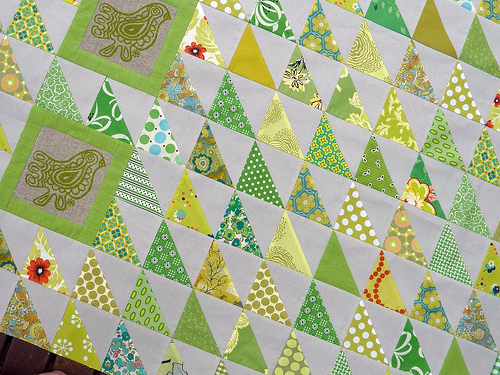 It is back to Half Square Triangles for they are so versatile, make for really great quilts, and provide comfort piecing after an episode of curved piecing. I can highly recommend them for their therapeutic benefits. It is still a work in progress. Although I had envisioned the overall look of the quilt, it was not until yesterday as the blocks were arranged on my design floor for the first time, that I could finally see the overall effect of the design and colors. As I needed to get this off the design floor, some of the parts have already been pieced together, others are still in stacks of numbered rows. More piecing today. Happy Stitching! This quilt is looking good!!! Such beautiful bright and cheery fabric. I really like the Prints Charming bird fabric. Nice! I love the little bird popping in with a square. And I'm ready for those nice spring-y greens. Too bad we're solidly under snow! There's nothing like a stack of HST units! Oh, the possibilities! Bet you've already finished it by the time I post this comment. LOve this quilt!! Screaming Spring!! I've said it before, I'll say it again....."you are so clever...love your work"! Beautiful. Greens are my favorite. Oh for the love of HST's. They are just a wonderful wonderful shape to work with. So much you can do, is right. I love your newest creation. It's looking great Rita! Can't wait to see the finished product! Just beautiful. I was actually looking at doing something very similar for my husband's birthday but was scared. You've inspired me! Half square triangles it is!! 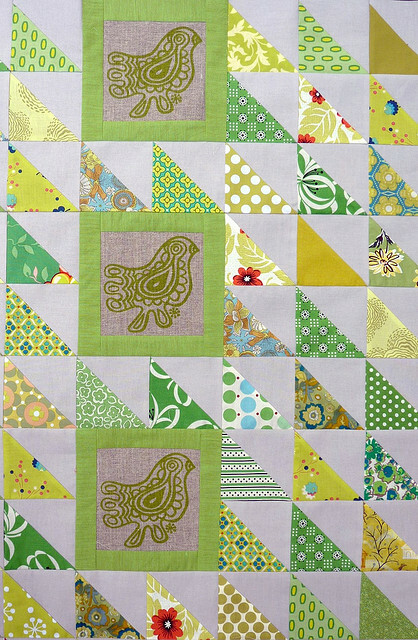 Love those colors together and the bird print is really wonderful, will have to check out their fabric lines. I can't believe how much you get done! You finish one project and you are knee deep in another one in no time. You are amazing! So cute, you have inspired me. I have a piece of fabric that I was just so frustrated with. Now I have an idea. Thanks. I love the way you put colors together! It's truly beautiful. My oh My you are certainly into green right now, it all looks so lovely and crisp and fresh... love it! that is a lot of triangles... i don't know if i could ever make that many without going crazy.. but i look forward to seeing the finished quilt! Your HST are very pretty. Love your colors!!! Thank you for sharing both inspiration and "stats". It's amazing what you do with Half Square Triangles. I believe you may have convinced me to lean a lot more toward this way of quilt design for a while and see what I can come up with. The birds are wonderful. Just lovely...your sweet birds look so pleased to be surrounded by a field of perfect green points. How do you do it? Are you very deliberate about your placement of each half-square triangle, or do you follow some random strategy? 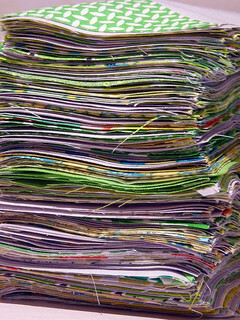 So love your quilts and your blog! I am so jealous of those perfectly matched points! No matter how slow and aware I try to be with my sewing, I never get everything all matched up like that. Beautifully done! I love it. Your quilts are so crisp and clean! Your points are perfect. They just look lovely! Wow I love those little birds. And the green. And the gray. Perfection. 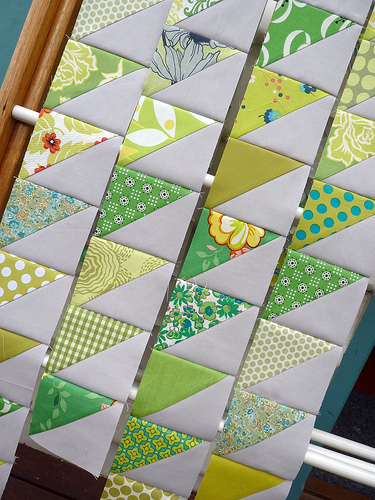 I just love the freshness and simplicity of your quilts! I love it, the bird bird is gorgeous. how pretty! love the birds. 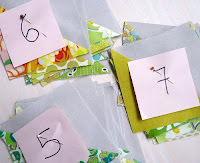 Do you piece your half squares as squares first, and then cut, or do you cut and sew together triangles? I've tried it both ways and not sure which i prefer. I feel your pain on the trimming!